There isn’t anything you can gleam from four games in a season. Baseball, as you might have heard, is an exceedingly long process. There are literally (literally!) 162 games in a season and we’ve seen all of four of them . For you math nerds, that’s 2.4 percent of the entire season. So while I find Connor Joe’s minor league numbers intriguing, and his early season struggles disheartening, I’m not quite ready to shoot him into the sun after eight plate appearances. Sure, the arm looks … bad? But that’s just part of the charm. That’s how you need to look at the outfield — really, the entire team — this season. Things are going to be weird and probably bad. I can live with weird. When a major league left fielder throws a ball that spends more time on the ground than in the air? Well, that’s just nifty and it doesn’t get more San Francisco Giants than that. 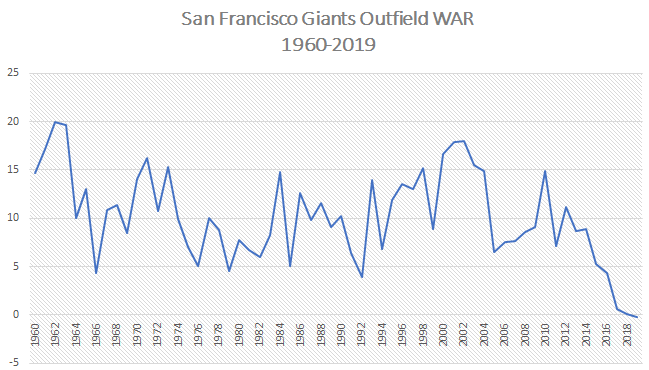 The bigger issue, even in the infancy of the season, is that the outfield could maybe be OK in the end, but the Giants haven’t bought themselves much credit lately when it comes to building an outfield. Since 1960, if you took all the WAR totals from the outfield, and ranked the bottom five, you would get this: 2018 (0.1 WAR), 2017 (0.6 WAR), 1992 (3.9 WAR), 1966 (4.3 WAR), and 2016 (4.3 WAR). The Giants have been downright terrible lately. Three of the worst five outfields of all time have happened in the past three years. The 2019 outfield is basically a gifted defensive center fielder with questions about how much he’ll hit and whatever Farhan Zaidi picked up off the waiver wire. The team even played Yangervis Solarte in left field today, which if you’re gifted with the power of sight, also isn’t ideal. There is some truth to say that if Connor Joe or Michael Reed had been in the Giants’ farm system last year, fans would be clamoring to give them a shot. However, that’s not so much of a resoundingly positive player assessment on either, but rather one of the farm and its lack of talent output in the past few seasons. There are overwhelming odds that the Giants are in fact a bad baseball team in 2019. Maybe even a really bad baseball team. This is a team in a rebuild without saying it’s in a rebuild. If there ever was a time to see if Connor Joe can give the team something at the major league level or if Michael Reed can be an asset, well, this is the time. It’s not going to be pretty, but bad teams rarely are. And no matter what, one day thirty years in the future, you can tell your grandchildren about the time you saw Connor Joe throw — ahem, roll — a ball to second base from the outfield.